The Grand National remains one of the most popular betting races of the year with forty runners tackling the famous Aintree fences. Punters may have been stunned by big priced winners of the Lincoln Handicap and the Irish National last weekend but there is plenty of confidence in the favourite On His Own. He will be ridden by Ruby Walsh who missed the ride last year after suffering an injury in an earlier race on the card. 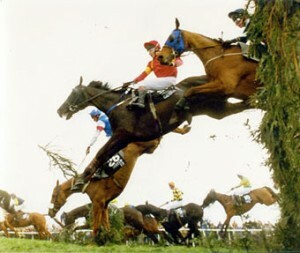 On His Own fell at Becher’s Brook on the second circuit when nicely placed in third and could provide Walsh with a third National following Papillon (2000) and Hedgehunter (2005). Champion jockey Tony McCoy rode his first Grand National winner with Don’t Push It in 2010 and has elected to ride Colbert Station this year, trained by Ted Walsh for owner JP McManus. He debated long and hard before passing up the ride on last year’s runner-up Sunnyhillboy, now the ride of Richie McLernon. Seabass and Cappa Bleu, third and fourth last year, also line up again. Seabass will be ridden by Katie Walsh who achieved the best placing in the race by a lady jockey last season. 2011 Grand National winner Ballabriggs could do no better than sixth last year and his chances have improved with the better ground. Top weight will be carried by 2010 Cheltenham Gold Cup winner Imperial Commander, unlucky to miss out on the Cheltenham festival but reported in fine form at home. Trainer Nigel Twiston-Davies will also be bidding for his third National triumph following Earth Summit (1998) and Bindaree (2002). Chicago Grey will be a popular choice to follow up the victory of Neptune Collonges last year, ending a long wait for a grey coloured winner. Chicago Grey tends to become detached in the early stages so don’t expect to see him at the front until late on. Paul Nicholls saddles three runners, the best of which may be Join Together. Teaforthree finished second in the Welsh National earlier in the season and is expected to perform a lot better than at Haydock last time out. Always Waining is finally given his chance to run in the Grand National having won the Topham Trophy for the last three seasons. Trainer Peter Bowen does not know whether he will stay the marathon trip but he is the automatic choice for anyone following “Horses for Courses”. Balthazar King has been heavily backed in the last few days with the drying ground in his favour. He has won over the Cross Country fences at Cheltenham so should feel at home here. Other outsiders worth noting are Rare Bob and Roberto Goldback. Trainer Dessie Hughes has planned for this race all season for Rare Bob and he ran an excellent trial in the Bobbyjo Chase. Nicky Henderson is yet to win the National despite saddling the runner-up at his first attempt way back in 1979. Roberto Goldback is another who will like the better ground and has reportedly schooled well over National style fences at home. On His Own stands out as the form choice at 7-1 with Bet365. Teaforthree (14-1) and Join Together (16-1) both look certain to stay the trip and Rare Bob could reward each-way support at 20-1.